This entry was posted in Uncategorized on September 30, 2010 by Anthony Hutton. 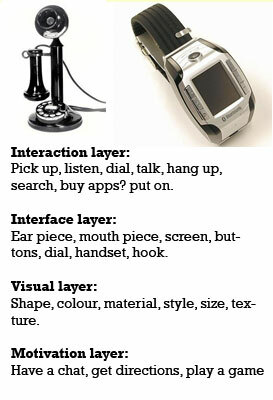 The design of most objects and systems can be examined in terms of four layers of design. 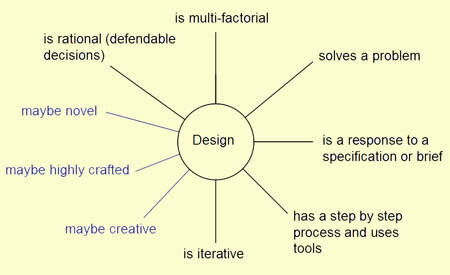 Visual elements of an objects and systems are typically their form, colour, texture, font, layout, styling. The design of vogue magazine is an example of visual design. The re-styling of the Ford Mondeo is visual design. Interface elements of objects and systems are typically the parts that you touch. In the case of a kettle the handle is part of the interface. In the case of a software system the system of navigation, menu’s, drop downs, data entry areas, buttons, cursor hotspots are parts of the interface. 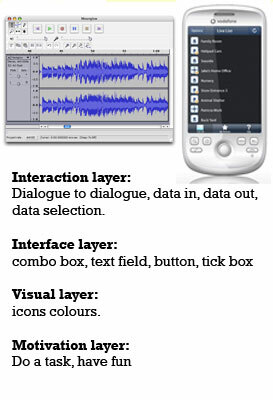 Apple made a significant improvement to the interface design of mobile phones when they released the iPhone. Interaction elements of objects and systems refer to what occurs when the object is in use. A chair is sat on. A chair is also moved, purchased, knocked over, stood on, fallen of, restored. A website is read. A website is also built, maintained, skimmed over, found, contributed to, etc. The development of Web 2.0 technologies made a significant contribution to the development of the interaction design of social media. Motivation drives users to do things, to interact. 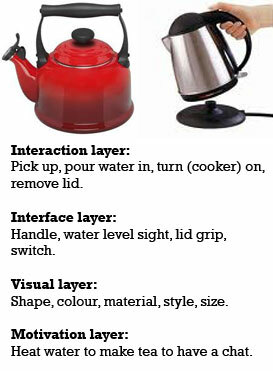 A user who is motivated by the need for a cup of tea will interact with a kettle, a tap, teabags and a teapot. Alternatively the thirst for tea may motivate the user to visit a cafe and order tea and scones. Understanding the subtleties of motivation depends on the actors, the play and the context. The choice of a type of glass to drink from is a motivation layer problem. It is unlikely that a crystal wine glass will be used for milk shake in McDonalds. In software systems it is unlikely that a sales manager will use the CAD software although maybe he should. Sometimes the layers get mixed up. In system design huge effort can be spent fixing up the visual layer when the problem is really a motivation layer problem. In other contexts a huge process of self analysis in the motivation layer muddles and delays innovation in the interaction layer. Sometimes a visual freshen up is all that a product needs to give it a new lease of sales. Making a specific effort to understand the layer(s) that the design problem exists on is a good first step in exploring a new design challenge. Imagine the process of making tea was a software task not a physical task! What would it look like? Lots of processes are converted from real world paper tasks into software tasks, for example: CAD, banking, education, travel arrangements. The process of conversion often involves making icons of the artifacts of the previous physical incarnation of the process. As I write this document in Word 97 I see a scissors and a glue brush for cut and paste functions: an echo of a paste up process long forgotten in document production. The Tea software should allow tea to be made and served for one or for many. It should allow for a mug of tea in a builders cabin to high tea on Sunday. The user should be able to go back and change their mind. The software should be capable of selecting from a range of cups or mugs and enable choice of types of tea for all or a single tea drinker. Wk6. Storyboard translated into a flow diagram. This entry was posted in Uncategorized on September 29, 2010 by Anthony Hutton. Here is a handy course structure diagram for the BDes Design and Communication Course. This entry was posted in Uncategorized on September 27, 2010 by Anthony Hutton. Welcome to the MDes programme. The Design Research Proposal module (DES806) will start on Tuesday 21st at 9.15 in MQ218. I look forward to meeting you then. If you scroll down through this catagory you will find last yearsmodule notes. This entry was posted in Uncategorized on September 20, 2010 by Anthony Hutton.